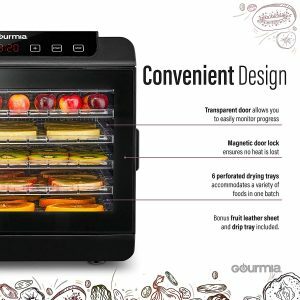 Gourmia GFD1680 is a countertop style 6-tray food dehydrator with a premium design, an electronic thermostat with preset temperatures and countdown timer. With the 360-degree airflow circulation hot air will be distributed evenly along the shelves for even dehydration. There is a free recipe book included in the box that shows the accurate time and temperature needed for different items. Recipes like raspberry mango fruit leather, cheesy kale chips or maple chili beef jerky are included You can make a variety of dried snacks from a variety of fruits and veggies and beef jerky. A drip tray and a fruit leather sheet are included in the box. Even uniform drying with no overheating will be achieved consistently with the 360-degree airflow circulation. You won’t need to rotate or turn the tray over, front and rear will be dried evenly. There is a transparent door that lets you see the dehydration process clearly without opening the door. With the proper sealing of the magnetic door lock the heat is trapped inside. There won’t be any additives or preservatives in these healthy, nutritious and tasty dried snacks unlike the store bought processed items. They will also be significantly cheaper when you make them yourself. This is a very good quality BPA-free kitchen appliance that is both efficient and safe to use, with an ETL certification. You can expect quality, high performance and good value overall from Gourmia kitchen products with innovative designs. Gourmia GFD1680 is made of BPA-free plastic, weighs 17.8 pounds and measures inches. It has six trays that measure 13 x 12 inches each. It runs relatively quietly with a light fan sound, so that you don’t need to put it in your basement or another room where you won’t hear the sound. The temperature can be adjusted between 104 and 158 degrees Fahrenheit, which are the minimum and maximum for this unit. You can set the temperature and do ten hours at a time and reset the time again for extra time. 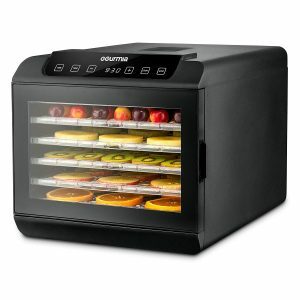 The dehydrator has an auto shut-off function so you don’t need to worry about security. It is offered with a warranty of one year by the manufacturer from the time you purchase it. The trays are not safe for being put in the dishwasher and you can wash them with warm water and soap. It has a 480-watt power motor that runs efficiently and quietly, and it will not add much to your energy bills. It is a high quality dehydrator with performance and user-friendly features, at a low cost. You will be getting more than what you pay for.